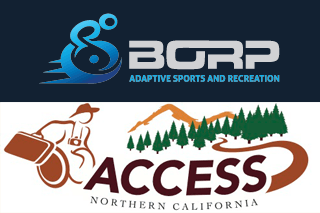 BORP has recently joined forces with Access Northern California (ANC), bringing their wealth of information and resources about accessible travel and outdoor adventures in Northern California under the BORP organizational umbrella. ANC was founded by former BORP staff person and ongoing supporter, collaborator and participant, Bonnie Lewkowicz in 1997. ANC’s vision is for all people with disabilities to have the freedom to participate in universally accessible travel and recreation, and this is a vision that naturally aligns with BORP’s mission and dovetails with our Adventures and Outings program. While we have been working closely with Bonnie for years, we couldn’t be more excited to formalize the relationship and welcome her (back) aboard the BORP staff. We look forward to the many ways that her work and the information available through ANC will enrich the lives of BORP participants and make it easier for people with disabilities to explore outdoor destinations and take advantage of Northern California’s rich array of natural resources. 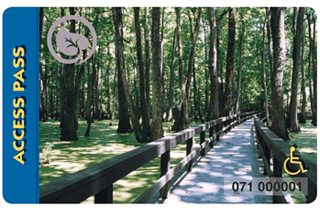 Both California and National Parks offer a disabled discount pass to qualified individuals. Sign up today to enjoy their benefits. There is a $10 processing fee to obtain it through the mail. You will need acceptable documentation proving you are a resident and have a permanent disability that substantially limits one or more major life activities. For more details visit their website. For persons with permanent disabilities, the disabled discount pass ($3.50 application fee) entitles the bearer to a 50% discount for vehicle day use, family camping, and boat use fees at California State Park operated units. Applications may be mailed, or obtained in person through most district offices (call in advance to ensure availability) and at the park pass sales office in Sacramento. Download the application. Go to the State Parks website to see what documentation is required. I am “out of tune” is a common expression used when we are stressed, anxious or have a physical illness. The immersive practice of therapeutic sound can help your body feel more “in tune”. Sonic healing is a powerful relaxation experience. In the class, we will breath, hum, chant and meditate. 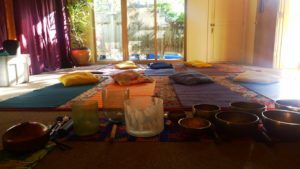 The practitioner uses singing bowls, drums, and other resonant instruments to stimulate the vagus nerve, which then activates the parasympathetic nervous system, resulting in a calming effect on the body. This class is accessible for all bodies and comfort levels. Participants are welcome to lie down on a yoga mat or sit in a chair. No previous experience required. Please wear something warm and comfortable and bring a yoga mat, if you wish to lie down (Yoga mats also available for use in the Fitness Center). Click here to view the BORP Fitness Center schedule online and register for classes. Click here to download a flier about the class. Minna Sivola is a certified Sound Practitioner. She has a private practice in Oakland. Minna also teaches Sonic Wellbeing classes around the USA and Europe. Last weekend the team spent over 10 hours on the court, topped off with an evening of team bonding and an early morning push across the Bay Bridge. 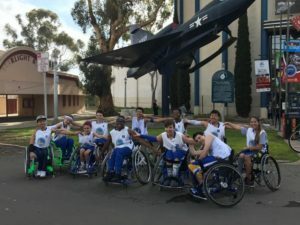 When one or two players got tired on the push, the whole team encouraged them, insisting that they finish the 9 mile journey as a team, taking turns to help push and pull each other to finish together. The team took all that hard work and team work with them to San Diego and played their hearts out. 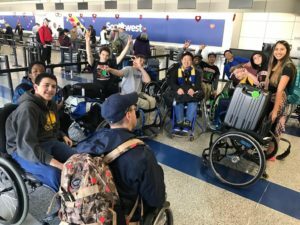 On day one of the tournament, “each one of the kids had individual moments of brilliance,” Johnson reported back to the parents in an email that evening. 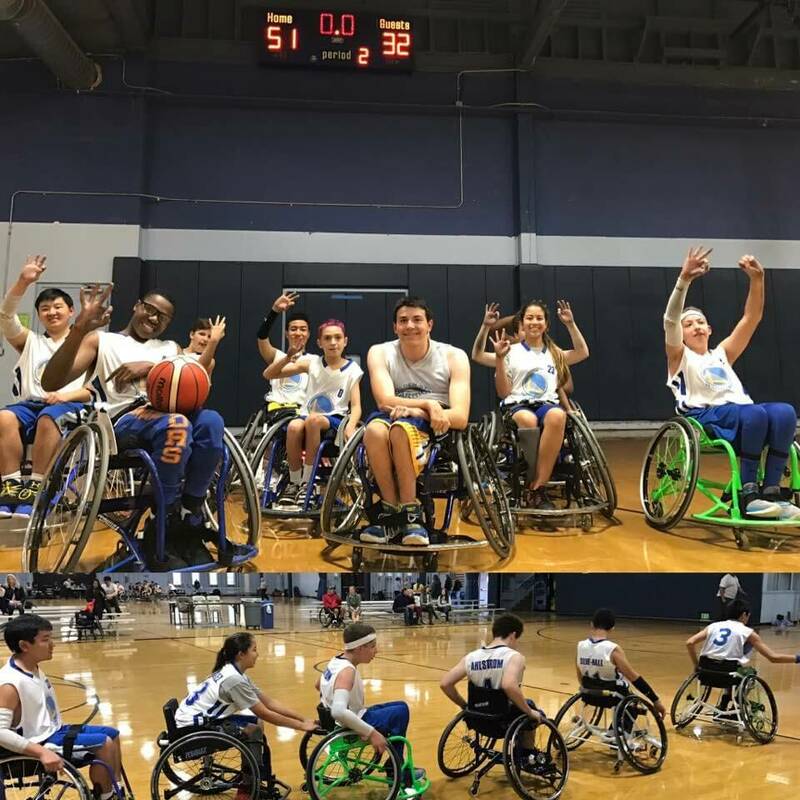 They had started the day off with an incredible opening game against Phoenix and a final score of 50-17. 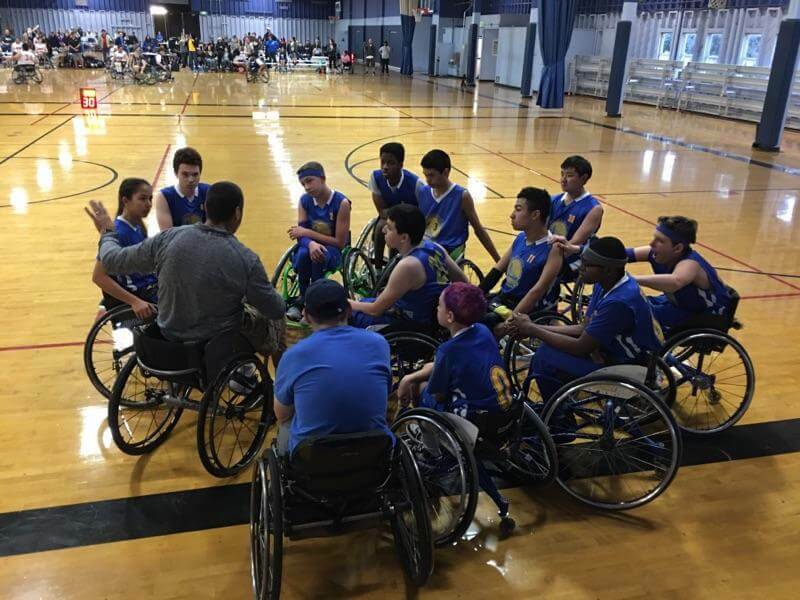 That was followed with a 54-31 victory over the Rancho Renegades, the first meeting of the season for the teams and a continuation of their Nor Cal/So Cal rivalry. The team finished off the day with a 51-32 game against Portland. The Jr. Road Warriors under the score board after their 51-32 win. Image courtesy of Trooper Johnson. The Jr. Road Warriors continued their winning streak on day 2 with a crushing victory over Fresno (the final score was 56-14). At the final game of the tournament the Jr. Road Warriors were set to play against Denver, the team that had defeated them in the last game of their previous season. 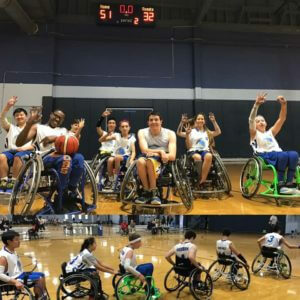 But “once again the team played incredible team ball and wound up posting a 52-31 victory,” Johnson wrote to the players’ parents after the tournament. So, from all of us at BORP to the Jr. Road Warriors players and coaches: CONGRATULATIONS!